Laurelhurst Craftsman Bungalow: Mini-Blinds are Period! It seems a little exciting to discover that something that seems so "modern" should actually have been in use in 1900. In Sharon's earlier research efforts, she doesn't remember stumbling across blinds before. This discovery should help us in selecting our window covering options next year. The excerpt from Frank Kidder's book: "Building Construction and Superintendence" 3d edition, 1900, pp. 271-273. 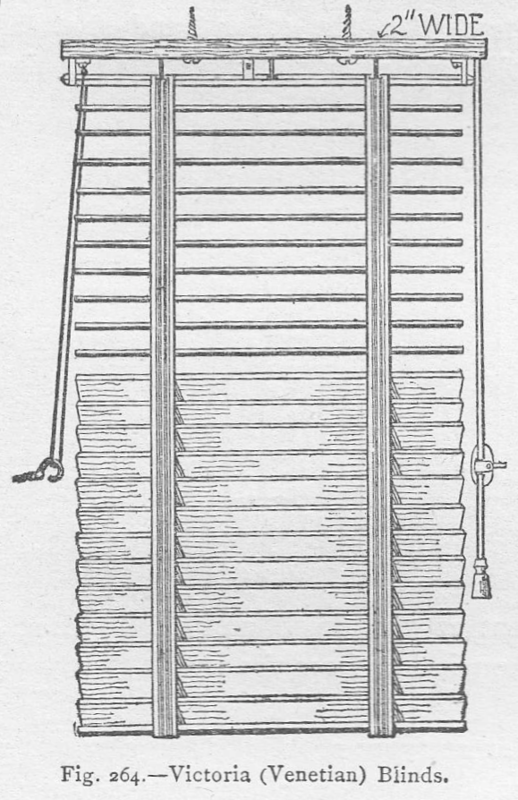 The common or English type of Venetian bllnd consists of a series of thin wooden slats 2 or 2½ inches wide, arranged laterally in woven ladder tapes, suspended from the top and connected by cords which raise or lower the slats or tilt them as desired. It is practically a window shade hanging free, but made of wooden slats instead of cloth. This blind is very extensively used in England and on the continent of Europe, and to a considerable extent in this country. It possesses an advantage over all other types of wooden blinds in that it may be easily fitted to any window, although it can be used to better advantage in windows having sub-jambs. 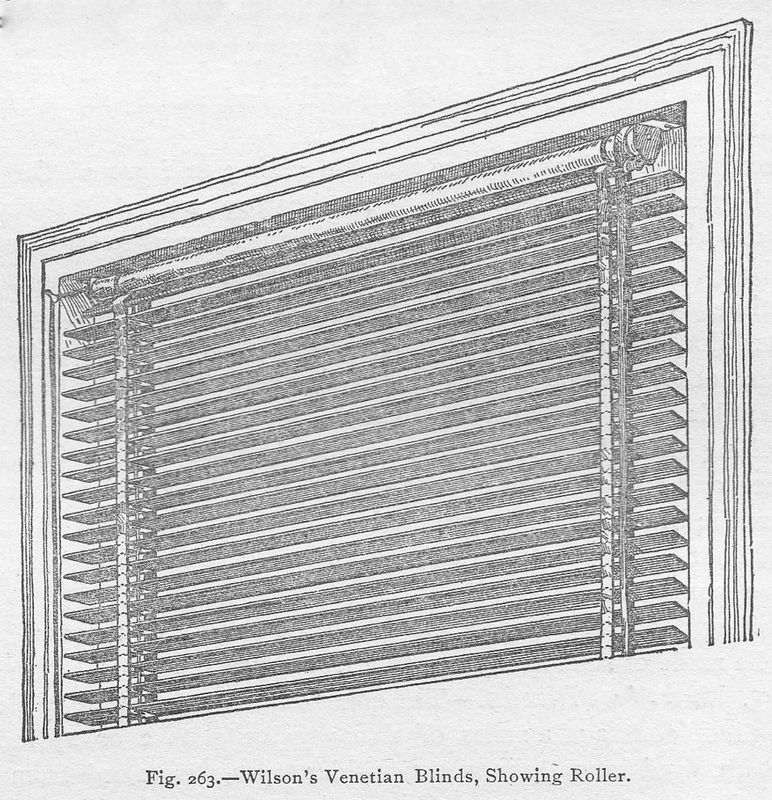 The admission of light and air is almost perfectly regulated and controlled, as part of the slats may be opened while the others are closed, or the blind may be drawn up so as to uncover the larger portion of the window. 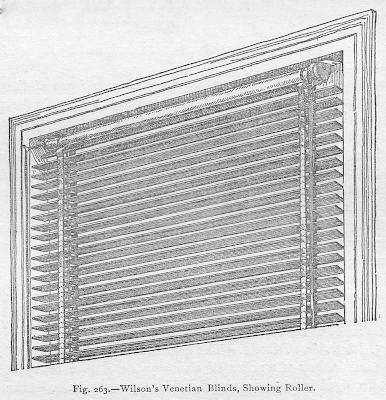 The common form of Venetian blind is made by several manufacturers in this country, and the general appearance, construction and manipulation is much the same in the different makes, the variations being in the method of hanging and applying to the window and in the quality of the materials and workmanship. For the best blinds metallic ladders, hinged to shut up like the tape, are used, being more ornamental, and it is claimed, more durable. In the manner of fixing the blind to the window finish each manufacturer has a special method. Thus the Victoria blind, Fig. 264, has a flat head piece 2 inches wide, which can be screwed to the stop bead at the top of the window when the latter is 1³⁄₈ inches wide, or to the under side of the head casing, where there are sub-jambs. It may also be fastened to the face of the window casings by small brackets. In our 1906-ish house in Oshkosh, there were wooden slat binds, but they weren't opened by cords like the Venetians. They were hinged doors, like bedroom closet doors, so they could be opened all the way to allow more light, or could be opened with just the slats to have filtered light. I don't know if that makes any sense. If I could get the scanner to work, I'd send you a picture. Then again, I don't know how old those were or if they were original construction.